LS Gallegos as prime consultant with subcontracting partners, AECOM and the University of Colorado Denver, Construction Engineering Department, is developing a Project Management certification program that prepares CDOT Project Managers to successfully manage and deliver the increasing number of projects across CDOT’s five regions. The Project Management Advancement Program (PMAP) is a fully customized blended learning program consisting of online and instructor-led courses, supported by practical activities that teach project managers to manage projects the CDOT way. 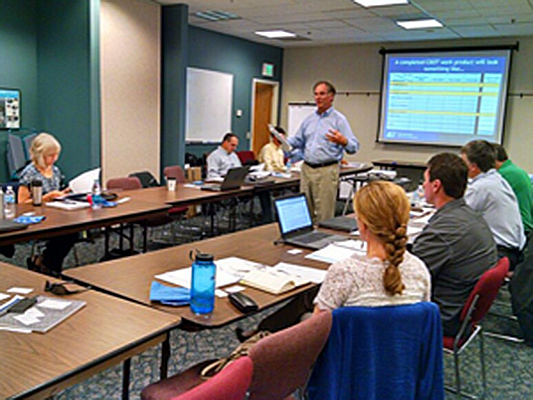 To compliment the PMAP coursework, LS Gallegos is leveraging Social Media tools to design create a PMAP Mentoring Program and Peer Groups that will connect Project Managers across CDOT’s five regions. Project Managers entering the PMAP can work towards certification at two levels – Practicing Project Manager and Master Project Manager.